Reference number for this case: 10-oct-54-Charmes. Thank you for including this reference number in any correspondence with me regarding this case. TOUL (From our newsroom). -- The flying saucer merry-go-round and other flying machines with multiple configurations, according to any appearance, had been sulky of the sky of Toul, except for the evolution at low altitude of a strange disc a few times ago in Gondreville. This abandon was only temporary, for now the resident of Toul can pour into the file of these phenomena his testimony, and this thanks to Mr. Roger Thiriet, 40 years old, warden in the penitentiary center of Ecrouves, domiciled rue du Petit-Bien in Blénod-les-Touls. His vision goes back to October 10, but so far, he had preferred to remain silent, fearing to be the target of laughter of his colleagues and the inhabitants of the community. In fact, the appearances recorded almost daily encouraged him to open up about the strange appearance of which he was the witness. On October 10 thus, around 6 hours 30, Mr. Thiriet was going by motorcycle towards his workplace. The day was not raised yet and, moreover, one rather dense fog obstructed the visibility. Suddenly, close to the railway bridge which spans R.N 60 road very exactly at the crossroads that this road makes with that leading to Charmes-la-Côte, the warden saw in the light projected by the headlight of his machine, a shape of aluminum color. Arrived at ten meters, he identified a "saucer". "It was posed, it seemed to me, right on the ground but I cannot say, because of the fog, whether or not it rested on a landing gear", he told us it was about 2 meters 40 in diameter and 1 meter 40 in height. Topped of a dome and with two portholes at its sides, it was circular." And he continued: "I immediately stopped my motor, but as I attempted to get close, the craft rose without noise and without any emission of smoke or flames. I followed its vertical rise during five meters, but the half-light and the fog prevented me from following its evolution. On the ground, I saw no trace. After my duty service, I stopped again at the location, but then again, I could not find the least evidence." Mr. Thiriet, who is a sensible man posed, does not seem to be able to be the subject of hallucination. Moreover, his conviction can be weighed by observations that were recorded by two of his colleagues. Those, during their service in the center of Ecrouves, saw the same day at about 1 o'clock, in the NE direction, a disc that left behind itself a reddish trail. In addition, the same day, in Longwy, an observer saw, at 01:30, an identical phenomenon. This is what makes Mr. Thiriet suppose that a correlation between these three visions is plausible. In this field, where checking is difficult, all theories are good! Anyway, it is certain that the declarations of the supervisor of penitentiary made it possible from now on to the residents of Toul to state, not without pride, that they also have "their" saucer -. A. [Captioned drawing:] According to the statements of Mr. THIRIET, the encountered apparatus was to appear approximately under this aspect. Roger Thiriet, a guard at the prison of Ecouvres, was riding a motorcycle when he suddenly saw an object of aluminum color in the form of a plate, with a cupola and two portholes. It was about 2 meters in diameter, 1 meter high and moved away immediately. 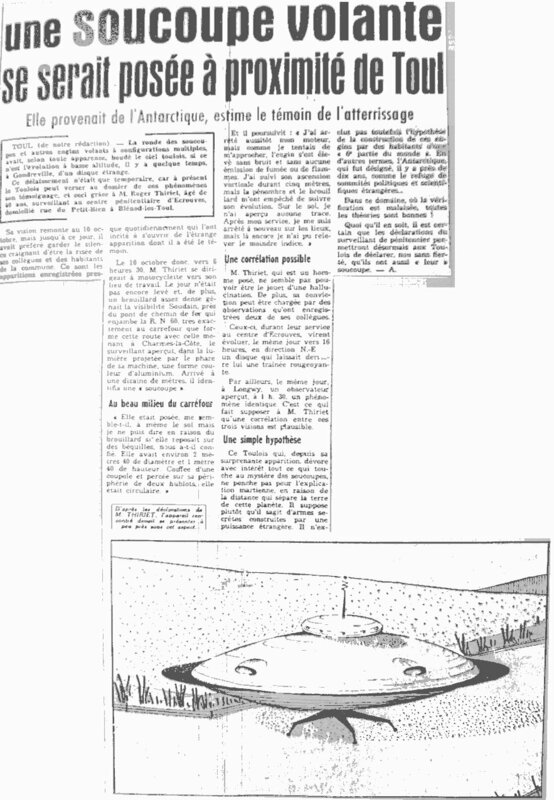 Michel Carrouges indicates that close to Ecrouves, Mr. Thiriet saw a saucer whose higher cupola comprised two port-holes, according to an news release by the A.F.P, for October 19, 1954. Roger Thiriet, jailer in the Ecouvres detention center, was riding his motorcycle when he suddenly saw an aluminum colored object shaped like a plate, with a dome and two portholes. It was about 2 m in diameter and 1 m high. It took off immediately. (France-Soir, 21 oct 1954) (54). The author indicates that on October 10, 1954, close to Charmes-la-Côte in the Meurthe-et-Moselle, a man on a motorcycle suddenly saw in the light of his headlight an object of aluminum color, in the shape of a plate, with a dome and two panels. The object was approximately 2 meters in diameter, 1 meter in height, and it flew away immediately. The witness was a prison warder in Ecouvres. These two French ufologists report in their book that on October 10, 1954, in Charmes la Côte, Mr. X, prison warder in Ecouvres, drove by motorcycle at 60:30 when he suddenly saw in the light of his headlight an object of aluminum color posed on the ground, in the form of a plate, with a dome, two panels of two meters diameter and one meter hight [sic]. The machine immediately flew away. The authors indicate that the source is the Vallée Catalogue, case 227. Godelieve van Overmeire indicates that in 1954, on October 10, in France, in Charmes-la-Côte (Meurthe et Moselle), "Towards 06:30 Roger Thiriet, prison warder in Ecouvres, drove by motorcycle when he suddenly saw an object of aluminum color having the form of a plate, with a cupola and two port-holes. It was approximately 2 m in diameter by 1 m in height and moved away immediately." The sources are indicated as "France-Soir, 21 Oct 1954" and "Jacques Vallée: 'Chronique des apparitions ET' - DENOEL 1972 - J'AI LU COLL. - p. 274, 275." 1954 - Roger Thiriet, jailer in the Ecouvres detention center, was riding his motorcycle in Charmes-la-Cote, France when he suddenly saw an aluminum colored object shaped like a plate, with a dome on top and two portholes. It was about two meters in diameter and one meter high. It took off immediately. (Source: Jacques Vallee, Passport to Magonia: A Century of Landings, p. 223). Jérôme Beau indicates that on Sunday, October 10, 1954, at 6:30, in Charmes-La-Côte in the Meurthe-et-Moselle, France, Roger Thiriet, warden at the prison of Ecouvres, drove on a motorcycle when he suddenly saw an object of aluminum color having the form of a plate, with a cupola and two port-holes, which was approximately 2 meters in diameter, 1 meter in height and moved away immediately. Jérôme Beau indicates that the source is France-Soir, October 21, 1954. Luc Chastan indicates that in the Meurthe et Moselle in Charmes la Côte on October 10, 1954 at 06:30 hours "the witness, prison warder in Ecouvres, drove by motorcycle when he suddenly saw an object of aluminum color having the form of a plate, with a cupola and two port-holes. It was approximately 2 m in diameter by 1 m in height and moved away immediately." The source is indicated as "Chroniques des apparitions E.T. by Vallée Jacques ** DENOEL 1972 - J'AI L coll.". The website indicates that on 10 October 1954 at 06:30 in Charmes-la-Cote, France, "An aluminum colored object shaped like a plate, with a dome and two portholes." The website adds: "Roger Thiriet, jailer in the Ecouvres detention center, was riding his motorcycle in Charmes-la-Cote, France when he suddenly saw an aluminum colored object shaped like a plate, with a dome on top and two portholes. It was about two meters in diameter and one meter high. It took off immediately." And: "Roger Thiriet, jailer in Ecouvres detention center, was riding his motorcycle when he suddenly saw an aluminum colored object shaped like a plate, with a dome and two portholes. It was about two meters in diameter and one meter high. It took off immediately." The sources are given as "Michel, Aime, Flying Saucers and the Straight-Line Mystery, S. G. Phillips, New York, 1958; Project Bluebook, (USAF) Blue Book files counted in official statistics; Bowen, Charles, The Humanoids: FSR Special Edition No. 1, FSR, London, 1966; Vallee, Jacques, Computerized Catalog (N = 3073); Vallee, Jacques, Challenge to Science: The UFO Enigma, Henry Regnery, Chicago, 1966; Vallee, Jacques, Preliminary Catalog (N = 500), (in JVallee01); Schoenherr, Luis, Computerized Catalog (N = 3173); Newspaper Clippings; Hatch, Larry, *U* computer database, Author, Redwood City, 2002." A few days later [compared to September 17, 1954], a warden of the prison of Ecrouve (54), driving on a motor bike, claims to have seen at 6 a.m., as the fog was thick, the shape of a saucer of 2,40 m in diameter (very precisely!) surmounted by a dome bored of port-holes. *Oct. 10, 1954 - At 6:30 a.m. Roger Thiriet, jailer in the Ecouvres detention center, was riding his motorcycle in Charmes-la-Cote, France when he suddenly saw an aluminum colored object shaped like a plate, with a dome on top and two portholes. It was about two meters in diameter and one meter high. It took off immediately. (Source: Jacques Vallee, Passport to Magonia: A Century of Landings, p. 223, case # 227). Roger Thiriet, the jailer at the Ecouvres Detention Centre was motorcycling to work through dense fog, when, by the railway bridge across the D 60 at the crossroads there, the light from his lamp reflected off an aluminum coloured object. When he got within 10m he could see that it was a disc, surmounted by a dome in which there were two windows, 2.4m diameter, 1.4m high. He was unable to see whether it was on legs because of the fog. As he got closer the thing took off without a sound, after 5m disappearing into the fog and dark. He could not make out any traces. Gross 1954. citing L'Est Republicain 20 October 1954. Vallee Case 227 citing France-Soir 21 October 1954. Not looked for yet. Possible hoax. [---] News release by Agence France Presse (AFP), France, October 19, 1954. [er1] Article in the regional newspaper L'Est Républicain, France, page 6, October 20, 1954. [fs] Article in the national newspaper France-Soir, Paris, France, October 21, 1954. [mc1] "Les Apparitions de Martiens", book by Michel Carrouges (aka Louis Couturier), Fayard publisher, France, page 227, 1963. [jv1] "Chronique des Apparitions Extra-Terrestres", French translation of "Passport to Magonia", book by Jacques Vallée, Denoel publisher, pp 274-275, 1972. [jv2] Summary by Jacques Vallée in "The Humanoids: A Survey of World-wide Reports of Landings of Unconventional Aerial Objects and Their Alleged Occupants", book by Charles Bowen, Neville Spearman publisher, USA, 1969. [fr1] "OVNI, Premier Dossier Complet Des Rencontres Rapprochées En France", book by Michel Figuet and Jean-Louis Ruchon, Alain Lefeuvre publisher, France, page 142, 1979. [em1] "Lorraine - Les visiteurs du ciel", article by François Moulin in Est Magazine, France, December 30, 2007. 1.0 Patrick Gross April 18, 2009 Conversion from HTML to XHTML Strict. First formal version. Additions [fr1], [go1], [lc1], [ud1]. 1.1 Patrick Gross February 19, 2010 Addition [em1]. 1.3 Patrick Gross October 29, 2011 A search on the web and in my documentation did not reveal other sources. 1.4 Patrick Gross September 19, 2014 Addition [cm1]. 1.5 Patrick Gross October 9, 2014 Addition [ni1]. 1.6 Patrick Gross January 24, 2017 Additions [fs1], [ub1]. 1.7 Patrick Gross January 22, 2019 Addition [pr2].